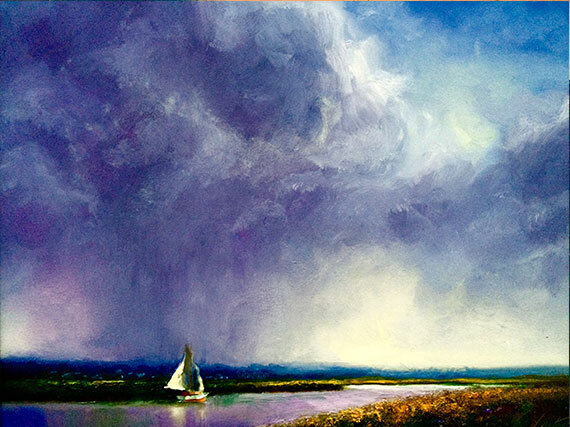 Mobile Bay Seascape Oil Painting "Mobile Storm"
One of those old time sayings that hang on for centuries. I thought to myself the devil may be beating his wife, but the good Lord has sure presented us with some gorgeous subject matter. Hope you like. While out in the marsh, outside of Mobile Bay, this painting happened quite accidentally. A sailboat was entering Mobile Bay and some non-threatening rain clouds happened to be right in the area. I love it when on location painting, different subjects present themselves that were not planned for.